Celebrating Halloween: Harmless or Heretical? By request, this blog will deal with the topic of Halloween, its origins, and traditions. Furthermore, we will be discussing the age-old question… “Is it okay for Christians to celebrate Halloween?” For followers of Christ, can Halloween be celebrated harmlessly and “just for fun”? Or, should Christians abstain from associating with this dark holiday altogether? The Bible is our roadmap for life; however, there comes times when we may not be able to specifically find an answer, verbatim, which we are looking for. In instances like this, we are to be guided by biblical principles. Scripture does not say, “Thou shalt not observe Halloween” – although it does speak against darkness and evil. But, what if someone observes Halloween in a way, they feel, is not uplifting evil? How can we teach, dogmatically, that such a thing is wrong? I believe that is where Philippians 2:12-13 comes into play. It says, “…work out your own salvation with fear and trembling. For God is working in you, giving you the desire and the power to do what pleases him.” Perhaps, it could also be that to whom God entrusts more, He requires more of. While doing this study, I grappled between two schools of thought. The first being, that Christians can celebrate Halloween and pass out Gospel tracts with the candy to their trick-or-treaters; and/or dress in costumes that are “cute” or “fun” and not evil. The second school of thought is that we must please God above ourselves and steer clear of anything that could even be perceived as evil. My personal stance of NOT celebrating Halloween was reconfirmed during my studies. Nonetheless, I must remain unbiased, as to refrain from pushing my opinion upon others. But, there also comes a time when I must share more than my mere human opinion. I must share what I’ve studied and what scripture says. I must share what I feel would lead others in the best direction and which would be honorable to our Lord. 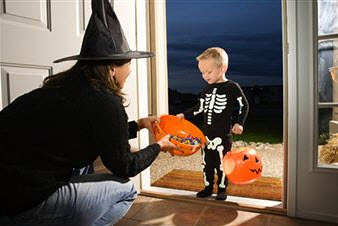 *20% of Christians said they saw no problem with celebrating Halloween for the kid’s sake or as a fun tradition; as in handing out candy, dressing up, going door-to-door to Trick-or-Treat, etc. *30% of Christians said they were altogether against celebrating Halloween in any shape, form, or fashion. *50% of Christians said they were against the evil costumes and the origins of Halloween, but thought as long as the costumes were decent and if it was held in a controlled environment (such as a church setting) that it was okay to celebrate Halloween; perhaps renaming it “Fall Festival” or another term. Many of us dressed up for Halloween and went Trick-or-Treating when we were kids. I’ve heard many say, “I dressed up for Halloween when I was little and it never made me demon-possessed.” While that may be a true statement for most, it may not be for others. Furthermore, did we have the knowledge of Halloween’s origins when we were little? Perhaps, our knowledge has increased. James 4:17 says, “Therefore to him that knows to do good, and does it not, to him it is sin.” Let us firstly establish the origins of Halloween and later determine if it would be good or bad for us to celebrate it. I will present you with the information and let you decide for yourself. The most ancient accounts of Halloween were found among the Druids (Celtic Priests) in the British Isles as far back as the Third Century BC. November 1st was considered their New Year celebration but the celebrations began on October 31st. The sun god (Lugh) was given thanks for the harvest, and there was a ritualistic mourning of the coming shorter days of the winter months. It was also one of the four times in the year that bonfires were lit on the hills in honor of Bel, the Biblical [evil] Baal. The Celts believed that on October 31st Samhain (their Lord of the Dead) gathered up all the souls of those who had died in the past year, who had since been confined in animal bodies. In order to appease him, and release the departed souls that they might enter Druid heaven, horses and humans were sacrificed by burning them in wicker cages. (In later European customs, black cats replaced the horses and humans.) Then, in the eighth century, Pope Gregory III designated November 1st as a time to honor all saints and martyrs; the holiday, All Saints’ Day, incorporated some of the traditions of Samhain. The evening before was known as All Hallows’ Eve and later Halloween. In the Roman Catholic church, Catholics are called to remember and pray for the souls of deceased family and friends, who are in Purgatory, in order that they may be saved. The belief in Purgatory is not scriptural nor is it acceptable to worship any other gods except the one true God of the Bible. Nonetheless, the aforementioned paragraph teaches us how Halloween originated. “Hallow” is a term translated, “Holy” – much like we pray in the Lord’s Prayer, “Our Father which art in Heaven, hallowed be Thy name” (see Luke 11:2). But on All Hallows’ Eve (Halloween), what or whom is being regarded as holy? The dark, occultic world marks Halloween as one of their highest “holy days”, but their idea of “holy” is not what God would consider holy. In contrast, scripture mentions holy days (holidays); however, the context of scriptural holy days were Jewish feasts, Sabbaths, and the like. In regards to scriptural holy days, Colossians 2:16 says, “So don’t let anyone condemn you for what you eat or drink, or for not celebrating certain holy days or new moon ceremonies or Sabbaths.” You see, Hebrews 8:10 says that God’s laws are written on the hearts of His people; therefore, we will want to do right in order to please Him – instead of keeping a list of rules merely out of duty. One commentary, Barnes Notes on the Bible, puts it like this: “The sense is, that no one had a right to impose their [Jewish] observance on Christians, or to condemn them if they did not keep them. They had been delivered from that obligation by the death of Christ.” This same principle could loosely apply to Halloween; that the Christian should certainly not be condemned or questioned if he or she chooses to abstain from celebrating it. Their motive for choosing to abstain is their way of pleasing to the Lord. Harrington goes on to say, “Of course, Christians who observe this holiday are not truly taking it seriously. We may be imitating the old rites and rituals, but it’s all done in good humor and means absolutely nothing. At any rate, the true Christian knows that there is only one God — we certainly won’t be burning any bonfires to Baal or Samhain. But do the demons know that? The Apostle Paul seems to be addressing just such a situation in First Corinthians. The believers at Corinth didn’t worship idols, but they did have an association with the idolatrous practices of the day — they bought meat that had been ceremoniously offered to the old gods of wood and stone. Paul told them, ‘What say I then? That the idol or that which is offered in sacrifice to idols is anything? But I say, that the things which the Gentiles sacrifice, they sacrifice to devils, and not to God: and I would not that ye should have fellowship with devils. Ye cannot drink the cup of the Lord, and the cup of devils: ye cannot be partakers of the Lord’s table, and of the table of devils’ (1st Corinthians 10:19-21). You see, they knew that idols were nothing — and they certainly had no intention of engaging in idolatry themselves –so they felt they could, with a clean conscience, partake of that food. But some things are so spiritually defiling that even an innocent association with them can contaminate you, attract demons, and seriously compromise your Christianity.” Harrington asks a valid question: What does God think about us making a game out of that which has sent untold thousands to Christ-less graves? In regards to the jack-o-lantern, Emery goes on to say, “According to legend, the jack-o’-lantern took its name from a reprobate Irishman known as Stingy Jack who tricked the Devil into promising he wouldn’t have to go to hell for his sins. When Jack died he found out he had been barred from heaven, so he journeyed to the gates of hell to demand his due. The Devil doomed Jack to wander the earth for all eternity with only an ember of hellfire of to light his way. Thenceforth he was known as Jack O’Lantern. It wasn’t until Irish immigrants brought the custom of carving jack-o’-lanterns to North America that the more commonly available pumpkin came to be used for that purpose, and not until the mid-to-late 19th century that pumpkin carving became a Halloween staple across the United States.” Regardless of whether this tradition is real or folkloric, it is safe to say that its origins are dark. “An old proverb says, ‘When you sup with the devil, use a long spoon.’ Presumably, NO genuine Christian would want to sup with the devil at all and yet many may be doing so in ignorance. As a former witch high priest, now saved by Jesus, I was astonished by how many Christians let their kids celebrate Halloween. Some churches even sponsor haunted houses and similar events on what is the Number One satanic ‘helliday’ of the year. Halloween is an occasion when the ancient gods (actually demons) are worshiped with human sacrifice.